January 2017 issue on sale now! | What Hi-Fi? 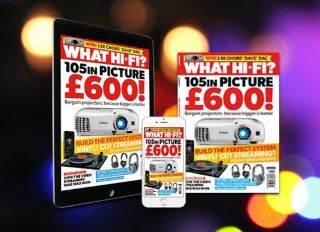 Our pre-Christmas issue is packed with top-quality hi-fi, noise-cancelling Bluetooth headphones and a parade of value-for-money projectors. Plus a battle between Netflix and Amazon Instant Video for 4K supremacy. Bigger is better, especially when it comes to home cinema - and if you can improve on scale without pushing up the price, that's an added bonus. As such, we've got a range of inexpensive projectors for you to feast your eyes on, as well as a bash between three wireless, noise-cancelling headphones from Bose, Sennheiser, and Sony. There's also the chance to win an £8000 Chord DAVE digital-to-analogue converter, just by answering a simple question. Follow the link, and submit your answer before Tuesday, 10th January 2017. You can subscribe or buy the latest issue here, or buy the digital edition on iPhone, iPad or Android devices for reading on-the-go. Finding the best individual product is time consuming (which is why we do it - so you don't have to!) but manageable. Making a good system is harder and, a lot of the time, can come down to trial and error. But there are well-marked routes to follow to make sure the whole is more than the sum of your parts, and this issue is the one to show you the way. One of the high-price, high-quality products featured in this issue is the Burmester 099/956 Mk2 pre/power amplifier - yours for an eyewatering £6440. We've come to expect many things from Burmester products, such as their chrome front, top-drawer build and finish, and excellent sound quality. And this amp ticks all those boxes. If a very doting family member has gifted you with a few grand, you might be inclined to treat yourself to this shiny, spectacular example of audio engineering. While Christmas was a time for bringing people together, January is one for cable-less cans that will block out any outside sound. Bluetooth headphones are becoming more common, and Sony, Sennheiser and Bose are vying for your headspace. On the surface, you might think that there's not much between them, but we've put them through the wringer with a huge range of tracks - all of which can be found and streamed on the What Hi-Fi? Playlist. Amazon Instant Video has updated its services with 4K support, now making it the cheapest way to stream pixel-packed movies. But is this enough to dethrone the the King of Content? Netflix has been the consumer's favourite (and won 2016's What Hi-Fi? Award) - but change is in the air, and this year all bets are off. The $8 billion deal that resulted in Samsung owning Harman International is a sure sign of increasing consolidation in the consumer electronics market. And with connected cars incoming (Google and Apple are each rumoured to have one in the works) it's not surprising that Samsung wants to have its own product in the race. Consider that, along with Samsung's new-found access to Harman's huge number of software designers and engineers, plus its entrance into the Internet of Things, and it makes for a reasonable justification for the premium price Samsung paid. Of course, these are just the highlights of this issue - if we were to tell you everything we'd be here until 2018. Our First Tests pages has reviews of Denon's new budget AV amplifier, a sharply dressed wireless speaker from Bang & Olufsen, Google's potential iPhone-killer, the Pixel XL, and more. If you're heading into hi-fi this year, as a newbie or a long-time audiophile, this magazine is the place to start. Happy reading!